We are back with a new selection of videos to tickle your fancy. These videos are not all from this week, but they all made us laugh or caused our jaws to drop recently. Enjoy! In this clip from a game between Chile and Ecuador in the Under 20 League, finding that one little thing to give you the winning edge can be vital. But when even the South American announcers think you are ridiculous, you know you have gone too far. 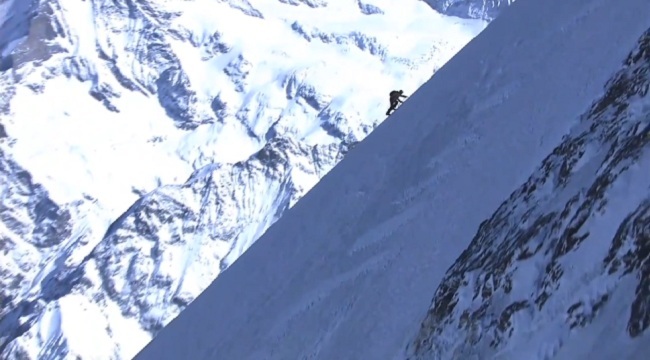 In order to set a new world record, mountain climber Ueli Steck decided to climb Mt. Eiger’s north face, but with a twist. This particular section of mountain is famed for being deadly, and has already claimed 64 lives. When Clint Eastwood filmed The Eiger Sanction on the mountain, one stunt man was killed, and several other serious accidents occurred. Basically, Eiger is no chump. Then along came Steck, who decided he wanted to set the record for the fastest ascent of the mountain, and he did it all without any safety equipment because he said it would slow him down. The first climbers to reach the top of Eiger took over three days. Steck did it in a ridiculous 2 hours and 27 minutes. A few weeks ago, UConn QB Johnny Mac showed off his trick shot skills in a viral video, and not to be outdone, Monmouth College QB Alex Taney has released his own video. ESPN followed up with Taney to check the validity of the video, and while he may have taken a few takes to get the shot he wanted, all of the throws are genuine, and awesome. The life of a soldier can be grueling and dangerous. You drill all day, then on a moments notice you may be called to risk your life. Anything can happen, and those that choose to wear a uniform to serve should be commended for they duty. It is a difficult life, and no one is saying otherwise, but when you nearly shoot yourself in the head while saluting, you are doing it wrong. In the clip below, a member of a foreign guard has a slight mishap and blows his hat off. The bullet was likely a blank, but if you ever manage to make yourself bleed while saluting, you have failed. Earlier this week we reported on a story surrounding the hacker group Anonymous, and the Westboro Baptist Church, a group of racist and bigoted sociopaths so lowly that the citizens of Mos Eisely would look down on them. The WBC is among the few groups that can actually make even the most stalwart of fans of the Constitution question this whole “Freedom of Speech” thing. You may have seen them on the news protesting soldiers funerals and telling the families that their loved ones deserved to die because God is mad at the U.S., and that is among their nicer hijinks. Recently, a suspicious announcement claimed that Anonymous was targeting the WBC, but Anonymous replied and claimed it wasn’t them, but rather the WBC themselves trying to gain some attention. During the interview seen below, the rep for the WBC continues to push the Anonymous rep, until she goes just a bit too far and Anonymous strikes back. Read the article for more details.